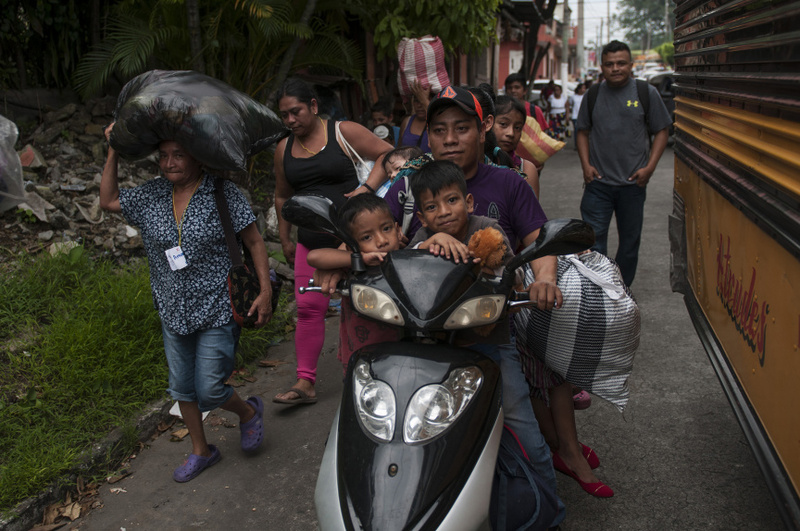 ESCUINTLA, Guatemala (AP) — Frightened people living near the Volcano of Fire fled with their children and few possessions when fresh flows of super-heated debris were announced, taking no chances after authorities gave them little time to evacuate before a deadly eruption over the weekend. Traffic came to a standstill on choked roads Tuesday and those without vehicles walked, even in central Escuintla, which was not under an evacuation order. Businesses shuttered as owners fled, memories still fresh of Sunday's blast, which left at least 75 people dead and 192 missing, and reduced a once verdant area to a moonscape of ash. "You feel powerless," she said. "I don't know where I'm going to go. To leave my things, everything I have." A column of smoke rose from the mountain Tuesday afternoon and hot volcanic material began descending its south side, prompting new evacuation orders for a half dozen communities and the closure of a national highway. The country's seismology and vulcanology institute said the smoke billowing from the volcano's top could produce a "curtain" of ash that could reach 20,000 feet (6,000 meters) above sea level, posing a danger to air traffic. Rescuers, police and journalists hurried to leave the area as a siren wailed and loudspeakers blared, "Evacuate!" "You have to be prepared, for the children," he said. By Tuesday the images of Sunday's destruction were familiar to everyone. What was once a collection of green canyons, hillsides and farms was reduced to grey devastation by fast-moving avalanches of super-heated muck that roared into the tightly knit villages on the mountain's flanks. Lilian Hernandez wept as she spoke the names of aunts, uncles, cousins, her grandmother and two great-grandchildren — 36 family members in all — missing and presumed dead in the volcano's explosion. "My cousins Ingrid, Yomira, Paola, Jennifer, Michael, Andrea and Silvia, who was just 2 years old," the woman said — a litany that brought into sharp relief the scope of a disaster for which the final death toll is far from clear.